Ummmm. This, my friends, is the very first time I have been completely confused with a Bottega Veneta Knot Clutch. I have to admit, I feel completely, 100% without a doubt, in love with knot clutches when they first and continued to appear. The design of these clutches wasn’t completely unique and in fact the designs themselves kept repeating one another over and over again. However, I appreciated every aspect each one had to give: the leather, the detailing, the simplicity, the eccentric-ness (is that even a word?). And then, and then I came across this version and I am not really sure. So, folks, here is the deal – I really do like this clutch. However the practically-centered side of me can’t help but wonder: If I were to buy a BV Knot Clutch, would this be the one? Now obviously, if money was not an issue, the answer would be: “yes, of course this is the one”. Yet, not all of us have that kind of money to throw around. 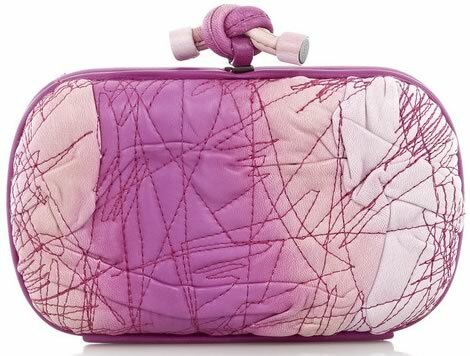 Look, there is no denying the fact that this Bottega Veneta The Knot Leather Clutch is really cute, feminine and flirty. I do really like the clutch. The purple and pink leather play off one another in the perfect Spring-tastic fashion. These are the colors I love to see everywhere in the Spring. 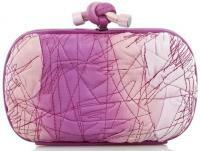 The purple scribble-effect stitching gives this grown-up clutch a fun twist. Really, to be honest, I’ve seen this same design on a bag I carried when I was, perhaps 8 years old. Was it BV? Absolutely not (not… knot, nice play on words, right?). Either way, this bag really is great, I’m just not sure as a BV Knot-less gal if this would be the first one I would splurge for. You? Buy through Net-a-Porter for $1180. What Bottega Veneta are you carrying *today* ?